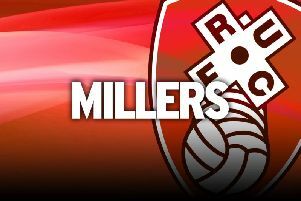 Jamie Proctor is expecting to be fit when Rotherham's Championship campaign resumes against Bolton on Saturday. The striker, who last week signed a new long-term contract, has missed the last three games with a groin problem. It put the brakes on his return from a long-term injury, which kept him out for a year, and has made it a frustrating start to the current campaign. He enjoyed a dream comeback, scoring two on his first appearance against Wigan in the Carabao Cup and added a first league goal in his next home outing. However, he has since struggled to establish himself in Paul Warne's side, playing second fiddle to Michael Smith, before the latest injury struck. The international break was well timed for the 26-year-old, who wants to make a comeback against his former club. “I am all good, that was really frustrating, being back from a long-term injury, feeling great and being back involved and scoring a few goals and then something like this to happen was very frustrating,” Proctor exclusively told The Star. “But now I feel like I am on the way back and I feel like this international break has come at a good time and hopefully I will be back involved in the next game. “That's the part of the battle of coming back from a long-term injury, along the way you get the highs and you get the lows, it's up to me to stay strong mentally and understand everything is not going to go smoothly. Despite missing all-but six games of the 2017-18 campaign with his cruciate ligament injury, Proctor remained on the scene and led the team out in the play-off final at Wembley. And he admits how lucky he was to be at a club, led by Warne, that kept him involved. "It is something I think about all the time, how lucky I have been being at a club I am at because there are other clubs where if you get the injury I got you get cast aside,” he added.